Presidents from the US and Cuba have historically sat down at a negotiating table for the first time in more than 50 years. Barack Obama met with his Cuban counterpart Raul Castro to discuss relations between the two countries. The meeting has been confirmed by the White House press service. "We are now in a position to move on a path toward the future," Obama told Castro at the meeting. "Over time it is possible for us to turn the page and develop a new relationship between our two countries." "We are willing to discuss everything but we need to be patient, very patient," Castro replied. The US President has thanked Castro for the “spirit of openness” during the remarkable meeting that followed the historic handshake between the two leaders, AFP reported on Saturday. 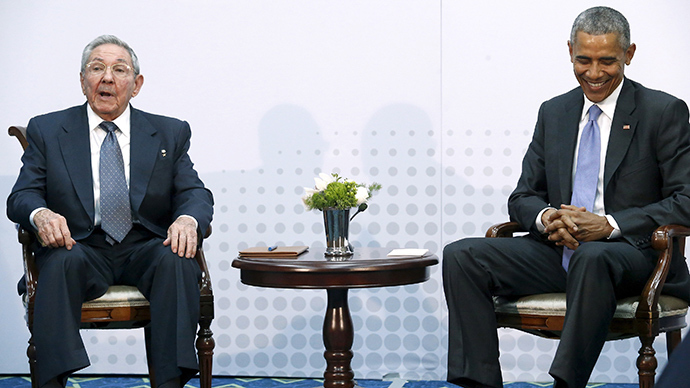 The meeting took place as both nations attended the Summit of the America’s, which is being held in Panama City. Earlier in the day, US President Barack Obama said "the fact that President Castro and I are both sitting here today marks a historic occasion," reminding that it was the first time the Cuban leader is attending the summit. “The Cold War is over ... Cuba is not a threat to the United States,” Obama told reporters, stressing the need to make the message clear. He also admitted that “there are still going to be deep and significant differences” between the two governments. Castro responded by saying he is open to dialogue, but warned that Cuba should not look be rushed into anything. “So we are willing to discuss everything, but we need to be patient, very patient. Some things we will agree on; others we will disagree,” the 83 year-old leader said. Over the past fifty years, relations between the United States and Cuba have been particularly strained. A socialist revolution in the 1950s led to a US embargo and a failed CIA-sponsored military invasion at the Bay of Pigs. The two countries only announced last year their intentions to seek better ties. The failed Bay of Pigs invasion in 1961 is still haunts the US government as Washington wishes to keep some details secret. Four out of five volumes of the internal account have been published. However, the Obama administration is determined the fifth volume remains undisclosed. A report by the CIA inspector general concerning the Bay of Pigs invasion was made public following a request under the Freedom of Information Act (FOIA). Upon being published, it issued a damming testimony of US plans from start to finish. It revealed a plot organized by President Dwight Enisenhower and authorized by President John F. Kennedy, which involved the CIA training Cuban exiles based in the US. They would then be used to launch a surprise attack against Cuban troops at the Bay of Pigs. The scheme was a disaster, with the majority of the 1,500 CIA-trained Cubans killed on the beach shortly after landing on the island. Cuba has been on the US list of state sponsors of terrorism since 1982. However, the US State Department formally recommended removing the Caribbean island from the list on Friday. In December, Obama announced his intentions to restore diplomatic relations between the two countries, but the slow pace of change has frustrated Cuban officials. Trade and Foreign Investment Minister Rodrigo Malmierca called the US measures“a step in the right direction,”but added hey did not go far enough in lifting the decades-long embargo. Meanwhile, the international community is still waiting for the promised closure of Guantanamo Bay prison, which was opened in 2001 at a US naval base in Cuba. During his first presidential campaign, Obama pledged to close the facility in 2009. There are currently 149 detainees in the prison, with half of those still behind bars, despite having been cleared for transfer.